Love him or hate him, Flo Rida will do anything to start a party. On Wild Ones, he shamelessly rips hooks from Brenda Russell's "Piano in the Dark" ("I Cry"), A Flock of Seagulls' "I Ran" ("Run") and Earl King's "Come On" ("Let It Roll"). 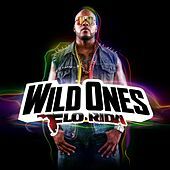 Every song builds from dramatic whooshing effects into a throbbing house beat while Flo Rida sings and raps about going to the club, getting girls, being a star, et cetera. It's a formula, but the payoff is frothy pop gems like "Good Feeling." Elsewhere, Sia growls soulfully on the title track, and Jennifer Lopez trills lightly on "Sweet Spot."